Meike Bliebenicht - Senior Product Specialist, Multi Asset. Alan Wateridge, Director, Business Development. In the world of multi-asset investing, winning strategies are always rooted in a robust decision-making framework and a forward looking approach. HSBC Global Asset Management has built, over the last 20 years, one of the largest and most experienced multi asset platforms in the asset management industry and is committed to providing investors with competitive risk-adjusted returns. In the first of a series of quarterly update calls for the HSBC Global Strategy Portfolios, Meike Bliebenicht, Senior Multi-Asset Product Specialist, will discuss the strategy, performance and recent positioning of the fund range, as well as providing an outlook for the coming months. 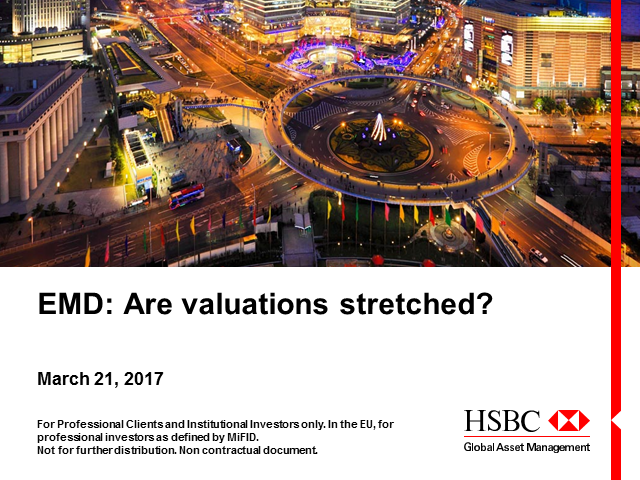 Join HSBC's Senior EMD Portfolio Manager, Vinayak Potti and EMD Trader, Scott Davis, as they discuss our approach to navigating the current Emerging Markets Debt (EMD) landscape. Amanda LaMarca, Senior EMD Product Specialist, will moderate the discussion. We believe that EMD valuations have now outpaced an improvement in fundamentals, leading to reduced risk premiums. This has occurred as policy uncertainty in developed markets and political risks in EM have increased. In this environment, we think relative value trades will be a key driver in delivering alpha. Thanks to supportive macro and political conditions and the spate of reforms introduced in recent years, the Indian economy has been gathering momentum and is set to reach its medium to long term growth potential. Join Gordon Rodrigues and Geoff Lunt to understand what the latest developments, including the repo rate cut earlier in August, mean for the Indian Fixed Income asset class and our strategy. We are also marking the fifth anniversary of HGIF Indian Fixed Income, which has seen its AUM swell to ~ $600 million earlier this year. Gordon and Geoff will explain why the asset class continues to look appealing when compared with most of its EM and DM peers, and why we consider it a strategic rather than thematic allocation in a global portfolio. The HSBC GIF Asia ex Japan Equity Smaller Companies fund continued its strong run as it delivered a total return of 23% for the first six months of the year, and remained in the first quartile among its competitors for 3-month, 6-month, 1-year and 3-year periods. In her second quarterly update webcast, Elina Fung, lead manager of the fund, will share the latest strategy and positioning of the fund. On this call, Elina will also answer questions from clients, so please free to email your queries to your local sales representative or you can also ask the questions live during the webcast. Emerging markets debt (EMD) has performed extremely well so far this year, and is showing historically low volatility. Price stability coupled with improving fundamentals in some EM economies are attracting funds into EM and lifting valuations in the asset class. Are EM valuations compensating investors for the risks? Please join HSBC portfolio managers, Nishant Upadhyay and Jaymeson Kumm, as they discuss opportunities and risks in the local and hard currency segments of the asset class. Brian Dunnett, Senior Product Specialist, will moderate the discussion. The HSBC GIF Asia ex Japan Equity Smaller Companies fund has recently stopped accepting new money from investors after its AUM reached USD1.3 billion in April 2017. The fund has seen great interest from investors on the back of its strong performance over the past year. In the first three months of 2017, the fund returned 15.6% on a gross-of-fees basis, not only outperforming its own benchmark (+12.8%), but also 88% of its competitors in the universe. In the first webcast of this quarterly update series, Elina Fung, lead manager of the fund, will share the latest strategy and positioning of the fund and explain how she implements the stock selection process in a noisy market. On this call, Elina will also answer questions from clients, so please free to email your queries to your local sales representative or you can also ask the questions live during the webcast. With monetary policy normalization in the US underway, managing duration exposure using short duration credit can help mitigate volatility in fixed income portfolios against a backdrop of rising rates. -What exactly defines the global short duration high yield segment? Joe Little, Chief Global Strategist at HSBC Global Asset Management, looks back at market performance over the past quarter and discusses the prospects for the year ahead. In this webinar, Renee Chen, Mandy Chan and Gregory Suen will share the key takeaways from China's National People's Congress (NPC) meeting and its implications to China's macroeconomic and asset class outlook.